Reid Diamond, bassist with seminal Canadian instrumental rock band Shadowy Men On A Shadowy Planet, died February 17 after a six-year battle with brain cancer, which had been in remission until last December when he was diagnosed as terminal. He was 42. Shadowy Men were one of Canada's most beloved bands from 1984 to 1994 for their musicianship, eventful live shows, absurdist wit and innovative visuals. They are best known around the world for providing music to the Kids In The Hall TV show, including its theme, "Having An Average Weekend." Diamond was born in Manitoba and spent most of his youth in Calgary, where he formed the punk band Buick McKane with Shadowy guitarist Brian Connelly and drummer Alex Koch; Kid in the Hall Bruce McCulloch was another Calgary friend. The trio moved to Toronto in the early '80s, and stayed with their friend Don Pyle in his mother's basement. Diamond, Connelly, and Pyle formed the Shadowy Men in 1984. Their intricate and melodic dance tunes set them miles apart from other surf-inspired bands, and The Pixies were among theit many high-profile fans. They released three full-length albums, and won a Juno for Instrumental Artist of the Year in 1992. The Shadowy Men were a pioneering band for independent music in Canada, becoming one of the country's best-selling indie acts. They were also known for their clever packaging; seven-inch singles could be packaged in a Jiffy Pop container or as a board game. The 1991 album Dim The Lights, Chill The Ham was released on pink, ham-like vinyl. Diamond was an integral part of the trio's approach to music and concepts. "Everything was quite democratic with us," says Pyle. "Most things in Shadowy Men were the product of the three of us talking, trying to one-up each other in terms of silliness or creativity. Reid's forte was the conceptual." The Shadowy Men announced a year-long hiatus in 1994, during which Diamond and Pyle continued to write together. 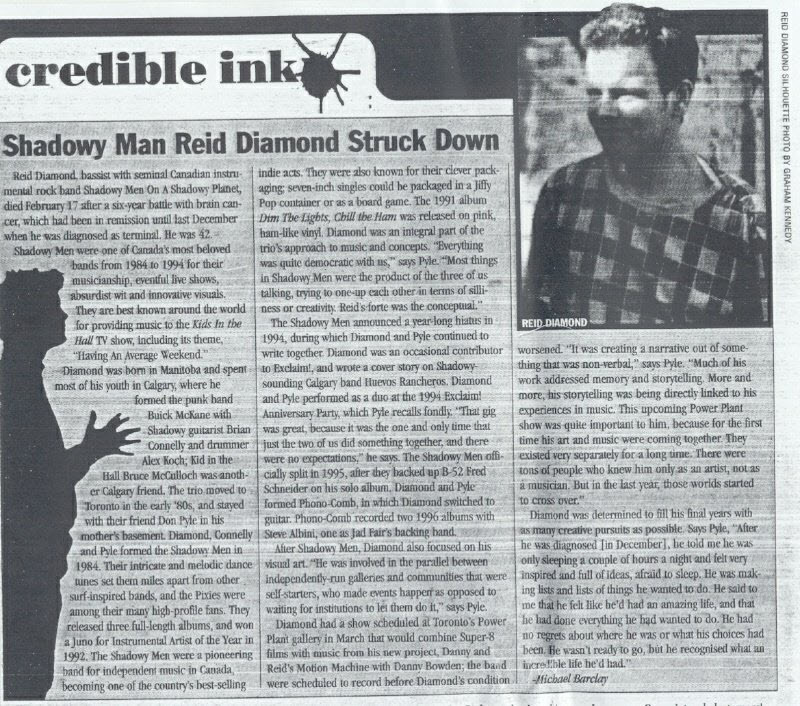 Diamond was an occasional contributor to Exclaim!, and wrote a cover story on Shadowy-sounding Calgary band Huevos Rancheros. Diamond and Pyle performed as a duo at the 1994 Exclaim! Anniversary Party, which Pyle recalls fondly. "That gig was great because it was the one and only time that just the two of us did something together, and there were no expectations," he says. The Shadowy Men officially split in 1995, after they backed up B-52 Fred Schneider on his solo album, Diamond and Pyle formed Phono-Comb, in which Diamond switched to guitar. Phono-Comb recorded two 1996 albums with Steve Albini, one as Jad Fair's backing band. After Shadowy Men, Diamond also focused on his visual art. "He was involved in the parallel between independently-run galleries and communities that were self-starters, who made events happen as opposed to waiting for institutions to let them do it," says Pyle. Diamond had a show scheduled at Toronto's Power Plant gallery in March that would combine Super-8 films with music from his new project, Danny And Reid's Motion Machine with Danny Bowden; the band were scheduled to record before Diamond's condition worsened. "It was creating a narrative out of something that was non-verbal," says Pyle. "Much of his work addressed memory and storytelling. More and more, his storytelling was being directly linked to his experience in music. This upcoming Power Plant show was quite important to him, because for the first time his art and music were coming together. They existed very separately for a long time. There were tons of people who knew him only as an artist, not as a musician. But in the last year, those worlds started to cross over." Diamond was determined to fill his final years with as many creative pursuits as possible. Says Pyle, "After he was diagnosed [in December], he told me he was only sleeping a couple of hours a night and felt very inspired and full of ideas, afraid to sleep. He was making lists and lists of things he wanted to do. He said to me that he felt like he'd had an amazing life, and that he had done everything he had wanted to do. He had no regrets about where he was or what his choices had been. He wasn't ready to go, but he recognized what an incredible life he'd had."